The artists participating in Miniatures 2 include ChrisHughes. Morgan Fisher's home page is at www.morgan-fisher.com and includes a page listing full credits, lyrics and artists' contact details. 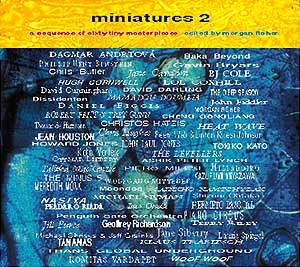 "Miniatures 2" is also available from Amazon.co.uk and other good online music sites. Consipio Multiplex (catalogue number MXCY-80002) in Japan. This label was formed by Yukihiro Takahashi (drummer of Japan's premier techno band YellowMagic Orchestra) and Yohji Yamamoto (the renowned fashion designer). Cherry Red Records (catalogue number CDBRED-165) for the rest of the world.They released the 1980 "Miniatures" as well as many other experimental recordings by Morgan Fisher.